Many home and business owners are searching for ways to save on their monthly heating and cooling bill, without keeping their home cooler or warmer than desired. The good news is, there are many ways to improve energy-efficiency by committing to ongoing maintenance and repairs of a home’s HVAC system. The 4 tips below will improve energy efficiency and ensure that heating and cooling systems are achieving their full potential. Changing furnace filters is something that homeowners can do themselves, and takes no more than a few minutes. 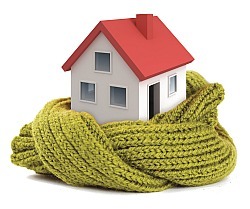 According to the Environmental Protection Agency heating can account for half of a family’s winter energy bill. If the furnace filters are dirty or clogged, then the furnace has to expend more energy to keep a home warm. This not only wastes energy, but makes the furnace work harder than it needs to—which can shorten the system’s lifespan. During the winter, furnaces should be checked on a monthly basis; check them approximately every three months during the summer. Filters may also need to be changed more frequently when construction is being performed in the home, or after a dusty windstorm. In an article on Bankrate, Jay MacDonald suggests having your furnace tuned-up by a professional on an annual basis. This will help to ensure that the furnace is working at its optimal level, and that areas of opportunity are addressed sooner rather than later. During the inspection, the HVAC specialist will take a look at belts connected to the blower motor, ensure that all heating ducts are clear, and that burners are working properly. Keep in mind that this is not a do-it-yourself task, but maintenance that should be left in the hands of a certified professional. Washington Energy Services recommends installing a heat pump as a more energy-efficient alternative to heating, cooling, and ventilation. While heat pumps are an energy-efficient method of heating and cooling a home or business in Washington State, they are not an ideal heating or cooling option for areas with extreme hot or cold weather. Just as with traditional furnaces, heat pumps require annual maintenance to ensure they are working at optimum efficiency. Even if an HVAC system is working properly, it may not be the most energy-efficient model available today. While upgrading to a new HVAC system will require an up-front investment, it is one that will pay itself back many times over—as long as the system is properly maintained. An HVAC professional will help home and property owners to determine the most appropriate system for both the climate and the size of their home or business. While there are many ways to save money on heating and cooling, some of the most substantial savings can be achieved by investing more time and money into maximizing the HVAC system. Once the HVAC system is improved and adequately maintained, home and business owners can explore other ways of saving money on their heating and cooling costs. This includes investing in energy-efficient windows and doors, programming their thermostat, strategic landscaping, and replacing the current roof or siding.